Congratulations to our PTRP and OTRP Top notchers for the Aug 2017 PT-OT Licensure Examination! 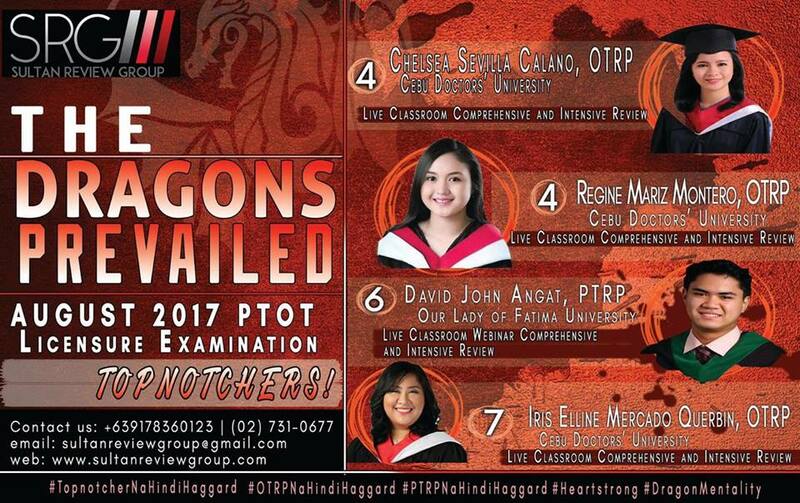 Congratulations to our new PTRP/OTRP Dragons for TOPPING the August 2017 PTOT Licensure Examination. They have proven that the Dragon Mentality know no bounderies and can reach great heights! Here, we present to you the topnotchers produced by our various programs: 1) the Live Classroom Comprehensive and Intensive Review , 2) the Local Classroom Webinar Review and 3) our In-House Review. No matter the platform, SRG ensures to deliver only the best quality review there is. SRG is here to help you reach your dreams—wherever you are in the world! SRG istruly proud of you! Previous Entry:Congratulations to our new PTRP and OTRP Dragons! Next Entry:Classroom Webinar Review for the February 2018 PT-OT Local Licensure Examination! !